Set Includes 1/4", 3/8" & 1/2" Ratchet 1/4" Sockets 4 - 14mm (13 Sockets) 3/8" Sockets 10 - 19mm ..
2 Component handle with pleasant soft grip material for highest torque. Screwdriver & T-handle in o..
Set Includes: 3/16", 7/32", 1/4", 5/16", 3/8", 7/16", 1/2", 9/16", 5/8" Length - 60mm..
Set Includes: 3/4" Ratchet 3/4" Extensions - 200mm & 400mm 3/4" Sockets - 22, 24, 27, 30, 32, 36,..
8 Pcs Deep Impact Socket Set Size - 22 , 24 , 27 , 30 , 32 , 33 , 36 , 38 mm L = 90 mm.. 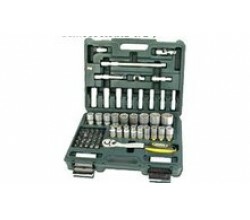 This Faithfull Screwdriver Bit and Socket Set is an excellent addition to any toolkit, containing a .. The Faithfull FAISBSET31Q set contains 30 colour coded S2 steel screwdriver bits made to ISO & BS st..